You will learn through problem solving discussions that are representative of actual ethical decisions you encounter in your clinical practice. The blending of Susan’s experience as a lawyer, work within the court system and extensive clinical experience makes her a hands-on, knowledgeable instructor! Explore the legal and ethical considerations for the treatment of minor populations in Oregon with regard to age of consent, confidentiality and custody concerns. 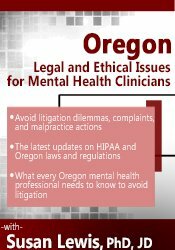 Analyze the limits of confidentiality as it relates to duty to warn law in Oregon. Nurses completing these self-study materials will earn 6.3 contact hours. Expires: 2/5/2022.